An executive order signed by President Trump on Jan. 27, affecting the ability of non-citizens to enter the United States, has prompted responses from students, faculty, staff and administrators at Tech. Beginning immediately upon the order being signed into law, non-U.S. citizens from Iraq, Iran, Syria, Libya, Sudan, Yemen and Somalia are prohibited from entering the country. According to information from the Office of International Education, this amounts to approximately 117 undergraduate students — the vast majority of whom are from Iran — who would be affected if they attempted to travel outside the United States before April 25. More than 120 employees of Tech are also potentially affected. President G.P. “Bud” Peterson sent two emails to the student body in the wake of the order, the first including a brief comment and the text of a statement from the Board of Regents and the second including a more personalized statement from Peterson. The first email consisted primarily of a statement attributed to Steve Wrigley, Chancellor of the Board of Regents, and addressed to University System Presidents. In the letter, he stated that the Board would continue to assess and provide updates on the situation to ensure that the “safety and well being of our campus communities” remains uncompromised by the changes in federal policy. President Peterson added to the Chancellor’s message that Tech was actively monitoring the situation and would provide further information to students on F and J visas on guidance they might find useful. The Board of Regents could provide no further comment beyond this letter. The second email came a day later and stressed the “fast-paced and fluid” nature of the order’s implementation, as well as Peterson’s pride in Tech’s international students and their contribution to Tech as a research institute and community. Several deans from Tech’s colleges sent supplemental emails expressing similar sentiments to students in their respective colleges. On Jan. 31, the Undergraduate House of Representatives (UHR) held an open forum concerning the recent executive order banning entry into the country from citizens of seven Middle-Eastern nations. The organizations giving presentations were the Office of International Education (OIE), their International Ambassadors program, College Democrats of Georgia Tech, the Latter-Day Saint Student Association, the Society of Black Engineers and the Muslim Student Association. Organization representatives presented their concerns and thoughts to UHR through a short speech or presentation, followed by questions from members of UHR. Many organizations asked for the Student Government Association to take action on the order, either by issuing a statement or by promoting inclusivity and tolerance on campus. Karvin Dassanayake, third-year CompE and International Ambassadors’ president of marketing, expressed concerns on behalf of several students at Tech following the election. 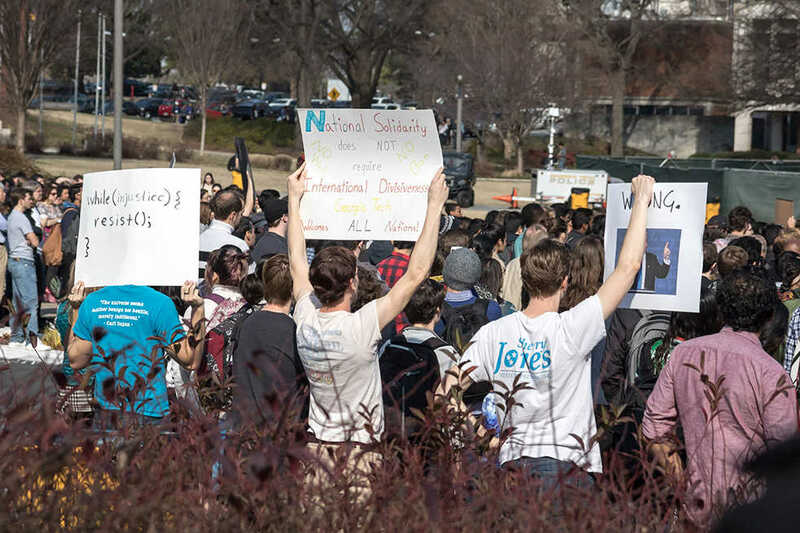 A student-organized solidarity rally took place on Feb. 2 and featured several student and faculty speakers who expressed concern and support for the community affected by the ban.